All text & images © The Flying Banana, 2011. 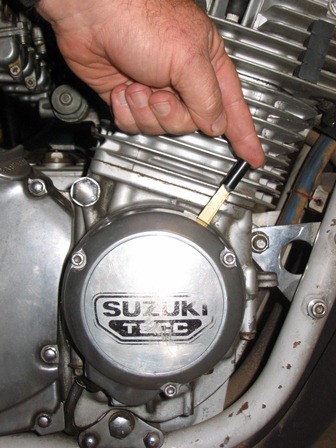 If ever you've owned a GS or GSX Suzuki, you'll have heard it. You're thumbing the starter button, the crankshaft has turned over a couple of revolutions, when suddenly your ears are assaulted by that almighty BANG/CLANG/KER-CHANGGGG or whatever you want to call it, emanating from the engine. Over the years  and my ownership of two GS1000S's and one mighty Katana  I have been putting up with The Clang (as we shall call it). What is its source? What is the cause? And what is the cure? Inspection of the starter clutch rollers (#5) which engage with the starter gear hub (#4i) was instructive; the poor things were at the point of disintegrating, with missing chips of steel. These chips were duly found adhereing to the magnets of the rotor, where they had been fouling the outer surfaces of the stator, and coming dangerously close to ruining the stator windings themselves. Hmmm. I then turned my attention to the starter gear hub  the surface which the clutch rollers engage with, and so rotate the crank when you're thumbing the starter button. With its shiny chromed surface, it wasn't hard to see the damage here; it was no longer perfectly round, but was now sporting a series of dips and rises where it had come into contact with the rollers. "Okay," I thought, "the Suzuki chappies are right  the starter clutch needs replacing." So I ordered a newie and popped it in, fully expecting that would be the end of the problem. Of course, as you've probably guessed, it wasn't. The Clang persisted. Now, this was in the days before internet access, so all I could do was make local enquiries. Someone suggested I hadn't properly aligned the starter clutch gear with the rotor  but this made no sense to me at all. I mean, what is there to align? 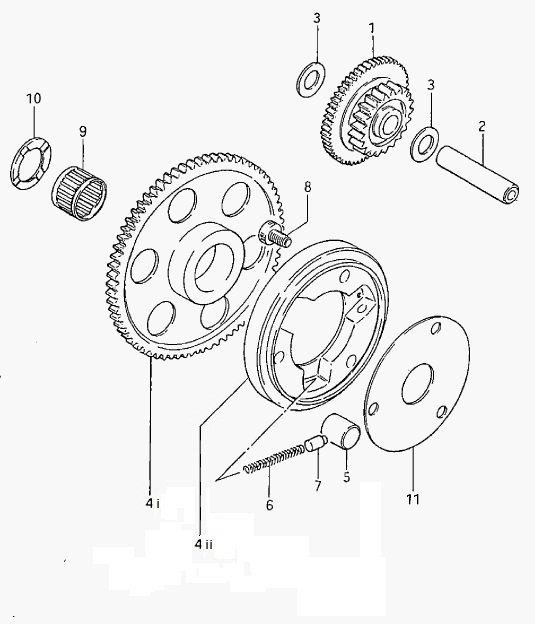 The clutch housing is bolted onto the rear of the rotor, which is mounted on the taper on the crankshaft, and the starter gear with its shiny chromed hub is likewise mounted on the crankshaft. My musings on this (so far) intractable problem were cut short because only a year or so later I sold the bike on. Then in Nov. 2003 I landed the mighty Katana. This bike was in rather tired condition, but that's one of the great attractions of these old air-cooled Suzukis: they are just so fixable! And so I set to fixing: electrics, wheel bearings, top end, brakes, jetting... it was a long list indeed. Also on the list was  you've guessed it  The Clang. So again, I whipped the starter clutch out, and lo and behold, more damage... the starter gear hub was showing it's series of dips and depressions. The rollers seemed OK, but ominously the outer pressed metal 'sleeve' of the clutch assembly (#4ii) had three raised lumps on it, which could only have been caused by the push pins (#7) somehow being fired back into their holes. But how? By now the problem wasn't making any sense. Then in late Sept. 2006 I went and bought myself another mighty GS1000S. Like my first GS1000S and the Katana, this also suffered from The Clang. By now I was starting to just accept that this was one of the vagaries of GS/X ownership. But one day The Clang got worse and a lot more frequent. So, I hoiked off the alternator cover, put a puller on to the rotor, etc. and what did I spy when the starter clutch was exposed? 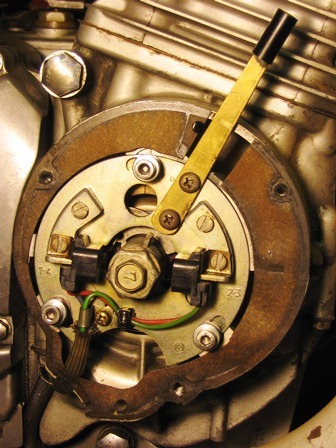 A hole had been clean PUNCHED right through the outer 'sleeve' of the clutch assembly (#4ii) and the spring (#6) and the push pin (#7) were nowhere to be seen. Fishing around in the sump, I found them: the push pin was intact, but the spring was well-and-truly flattened. How had the pin and spring been clean fired-through the pressed metal sleeve? After nigh-on 18 years of The Clang, let's just say the novelty was wearing off. 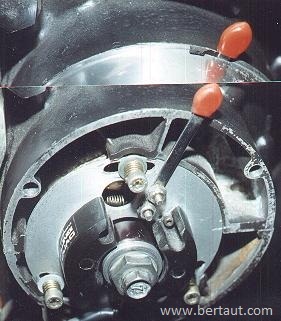 By now the theory had formulated in my mind, that the cause of all this grief was the starter clutch hub (#4i). The metal was too soft, I supposed, and the force of the rollers was creating the dips and rises in the hub surface. This then led to the rollers having difficulty engaging with the hub, and skipping across the surface until they suddenly grabbed the hub, producing The Clang and associated damage. The only problem with this theory, was that it didn't fit the facts. How had the push pin and spring been fired through the casing? One day (ca. 2010) I was fishing around on that wonderful online repository of GS/X wisdom, the GS Resources forum, and I came across a thread. The thesis of the wise chappies on this thread was that the problem was caused by the crank speed being too slow on start-up. That is, the relatively slow cranking speed means that the timing of the spark is too advanced, and if ignition occurs too far before TDC, the crankshaft reverses direction and it kicks the starter clutch in the teeth. Here, at last, was a hypothesis that accounted for all the observations and damage! And the solution? Basically, there are three. First, according to the thread on the GS Resources forum, you can modify the wiring in the right-hand switch gear on the handlebar. This method means that you can use the 'Run/Stop' kill-switch to turn on the spark from the coils once you have the crank spinning fairly quickly, thus minimising the risk of kick-back. Second, you can modify the bob-weights in the ATU, to allow for more retarded timing at start-up, but still get the correct amount of timing advance at operational RPM. This solution can be found at the Australian Katana website here. and finally, I carefully cut and filed a stepped slot into the ignition cover (so that the lever can't move of its own accord). ... and BEHOLD: the birth of the UBER-LEVER! That is, the Lever that is above and beyond all other levers. Then, the Moment of Truth: would it work? The answer, I am pleased to report, is YES. These days, the only time I get to hear the dreaded Clang is when I forget to engage the Uber-Lever. At long last, a 20-year-old (for me, at least) problem has been sorted.